Karbonn A50 a Budget Android smartphone with single core 1GHZ processor launched at price of RS 4490 . Well this handset doesn’t supports 3G networks . Karbonn usually launches budget smartphones without 3G functionality . We don’t no whether they get any sort of profit in that or not . But , we think most of peoples usually wants an android based smartphone at least with 3G functionality . It would be better to Buy MICROMAX A54 Ninja 3.5 ( unboxing & review ) at the same price as it does support 3G. Karbonn A6 will also compete with Karbonn A50 . The war of 1.5GHZ quad core devices in India , begins but still some manufacturer are launching single core devices . It has 3.5inch capacitive display having resolution of 320×480 pixels ( same that you find on Micromax ninja 3.5 ) . It is powered by 1GHZ single core processor integrated with 256MB of Ram . The A50 has 512MB of ROM & memory of the device can be expandable upto 32Gb via SD card . The device is running on Android 4.0 ICS . The handset offers access to DUAL SIM card slots . At the rear of the device there is 3MP camera & it does have front facing camera , probably it would be VGA . The device does offers WIFI , 2G , Bluetooth , EDGE , GPRS , FM RADIO & micro USB for dat sinking as well as for charging . It has G-sensor & proximity sensor . The device has 1300mAH battery which claims the talk time of up to 5 hours . The specs of the device are identically similar to Micromax A54 . There is no word for GPS as well for the device . 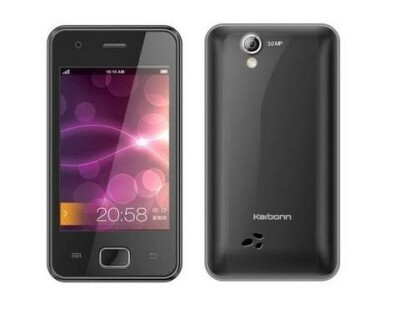 Buy Karbonn A50 via flipkart for RS 4490 .